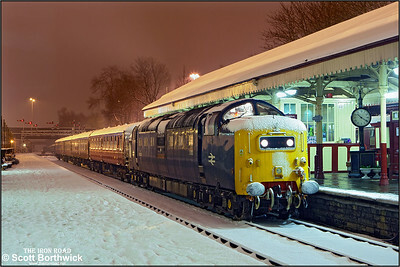 55022 (D9000) 'Royal Scots Grey' stands at Bury Bolton Street after arriving with a very heavilly delayed 1620 Heywood-Bury Bolton Street on 04/02/2012. 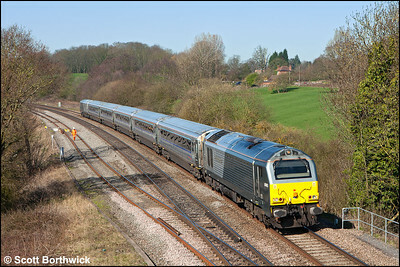 67013 'Dyfrbont Pontcysyllte' passes Hatton Locks whilst working 1H32 1055 Birmingham Moor Street-London Marylebone on 26/03/2012. 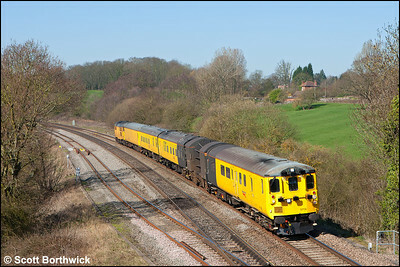 The Structure Gauging Train lead by DBSO 9708 and propelled by 31285 passes Hatton Locks running as 1Q06 0854 Derby RTC-Hither Green Down Recpn on 26/03/2012. 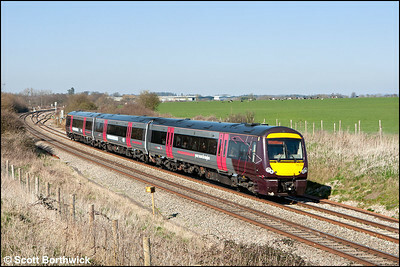 56312+56302 restart 6Z69 1200 Burton Wetmore Sdgs-Cardiff Tidal TC away from the loop at Abbotswood Jnct on 26/03/2012. 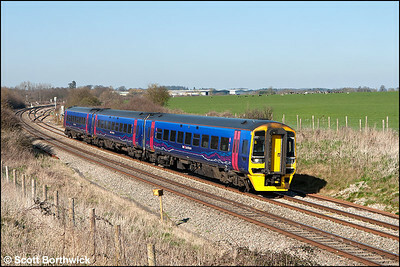 158951 forms 2O94 1450 Great Malvern-Weymouth at Abbotswood Jnct on 26/03/2012. 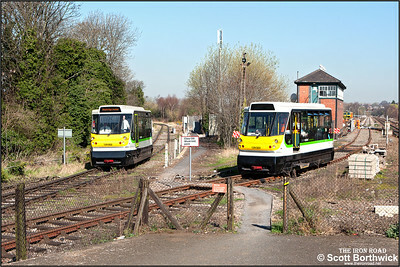 After failing the previous evening, 139001 undergoes repairs at Stourbridge Junction on 27/03/2012. 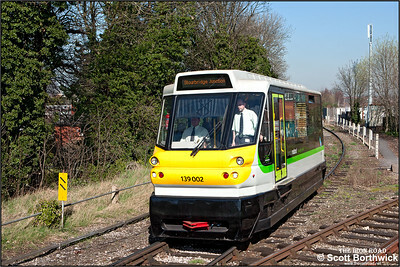 139002 arrives at Stourbridge Junction whilst forming 2P70 1134 Stourbridge Town-Stourbridge Junction on 27/03/2012. 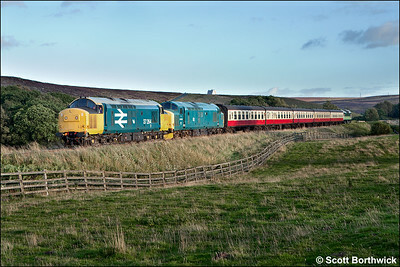 139001 undergoes repairs after failing the previous evening, making it possible to capture both members of the class alongside each other, an unusual event as one unit is normally stabled in the shed when not in use. 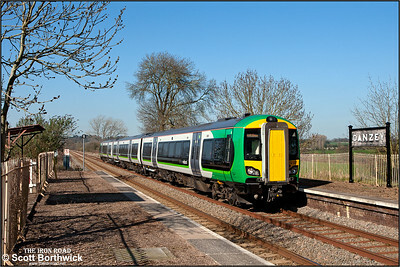 139002 arrives at Stourbridge Junction whilst forming 2P70 1134 Stourbridge Town-Stourbridge Junction on 27/03/2012. 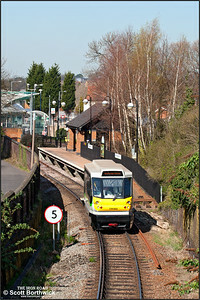 139002 arrives at Stourbridge Town whilst forming 2P91 1319 Stourbridge Junction-Stourbridge Town on 27/03/2012. 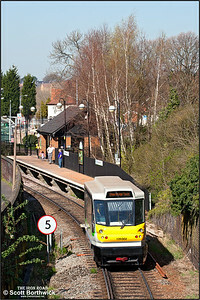 139002 departs from Stourbridge Town forming 2P92 1324 Stourbridge Town-Stourbridge Junction on 27/03/2012. 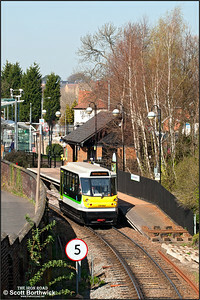 139002 departs from Stourbridge Town forming 2P94 1334 Stourbridge Town-Stourbridge Junction on 27/03/2012. 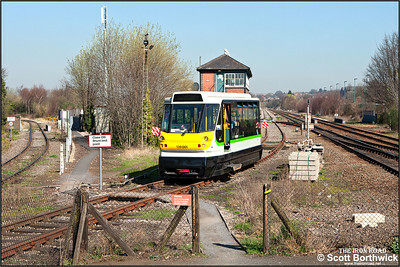 172337 arrives at Danzey whilst forming 2S54 1455 Stourbridge Junction-Stratford upon Avon on 27/03/2012. 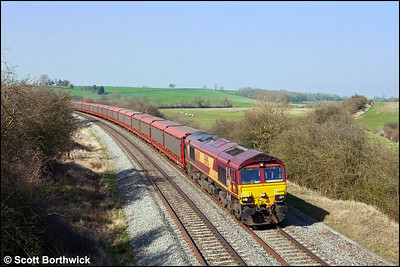 66009 passes Holmes House Farm, Bishops Itchington whilst in charge of 6O42 1131 Halewood Jaguar Cars-Southampton Eastern Docks with a trainload of covered car carriers conveying vehicles for export on 28/03/2012. 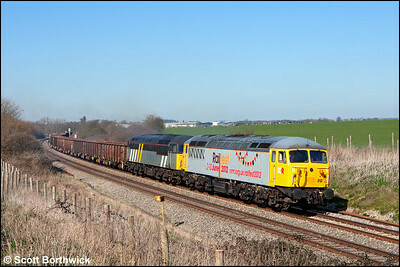 Running around 70 minutes early, 37261 and 97301 top & tail 1Q13 0733 Tyseley LMD-Old Oak Common TMD (via Hereford) at Holmes House Farm, Bishops Itchington on 28/03/2012. 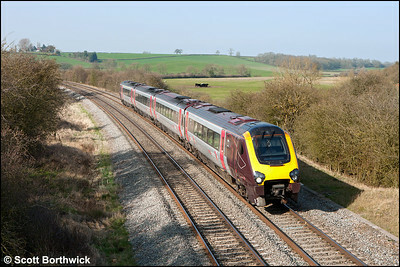 168109 forms 1H49 1512 Birmingham Snow Hill-London Marylebone passing Holmes House Farm, Bishops Itchington on 28/03/2012. 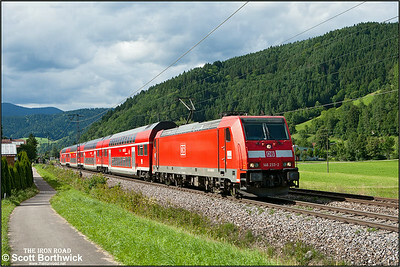 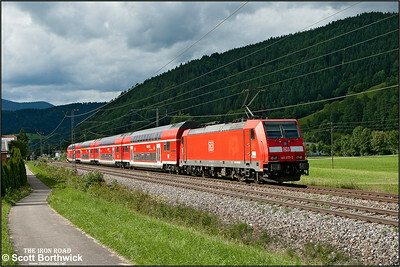 DBAG Class 146, 146 233, runs through the Black Forest passing Singersbach whilst working RE5327 1609 Karlsruhe Hbf-Kreuzlingen on 12/07/2012. 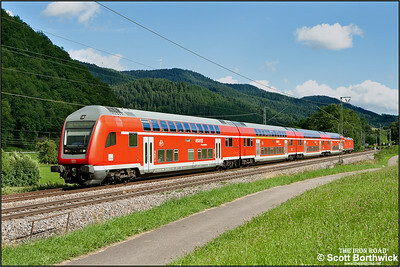 DBAG Class 146, 146 237, propels RE5318 1533 Kreuzlingen-Karlsruhe Hbf through the Black Forest passing Singersbach on 12/07/2012. 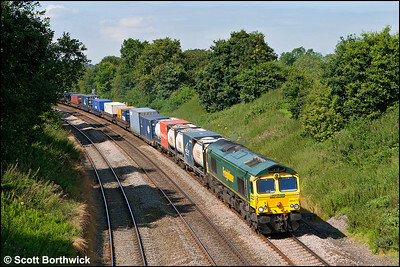 66571 coasts down Hatton Bank whilst in charge of 4O54 0615 Leeds FLT-Southampton MCT on 09/08/2012. 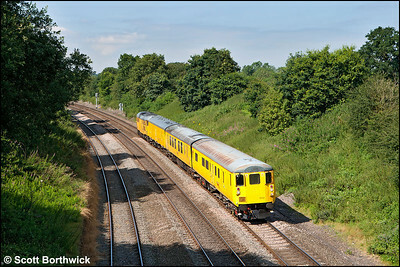 DBSO 9702 is propelled down Hatton bank by 31285 whilst forming 3Z80 0852 Derby RTC-Eastleigh Alstom Down Sdg on 09/08/2012. 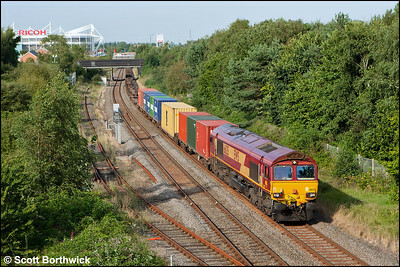 66125 passes Three Spires Jnct, Coventry whilst working 4O30 1319 Trafford Park-Southampton Western Docks on 03/09/2012. 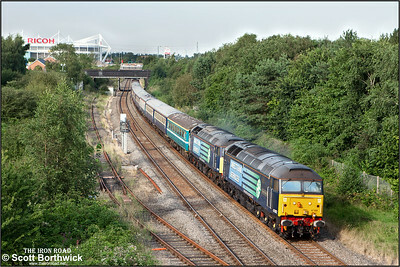 47802 'Pride of Cumbria'+47841 pass Three Spires Jnct, Coventry whilst working 1Z83 1059 Glasgow Central-Southampton Eastern Docks 'Cruise Saver' on 03/09/2012. 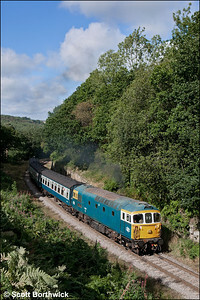 37275 rumbles through Moorgates whilst working 2P01 0930 Grosmont-Pickering on 14/09/2012. 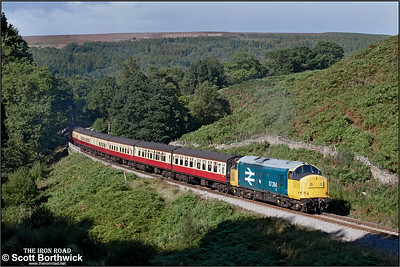 33108 thrashes up the bank at Thomason Foss whilst working 2A31 1010 Grosmont-Goathland on 14/09/2012. 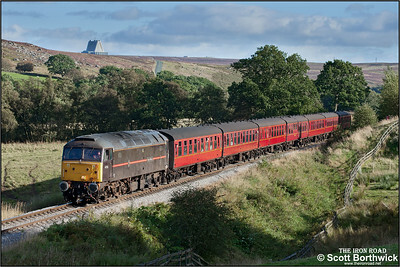 37264 powers up the bank at Thomason Foss whilst in charge of 2P03 1030 Grosmont-Pickering on 14/09/2012. 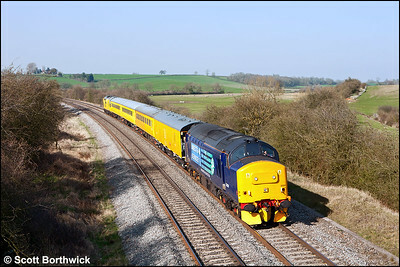 47798 'Prince William' is just visible hitching a ride to Pickering on the rear of the train. 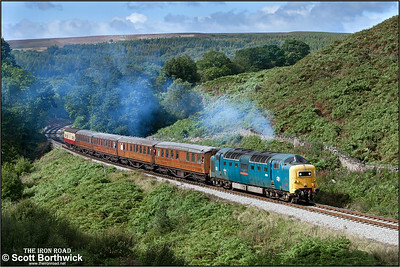 33108 makes its second trip of the day on the Goathland shuttle climbing the bank at Thomason Foss whilst working 2A33 1210 Grosmont-Goathland on 14/09/2012. 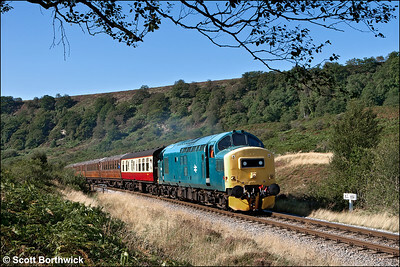 55022 'Royal Scots Grey' powers up the bank at Thomason Foss whilst working 2P07 1230 Grosmont-Pickering on 14/09/2012. 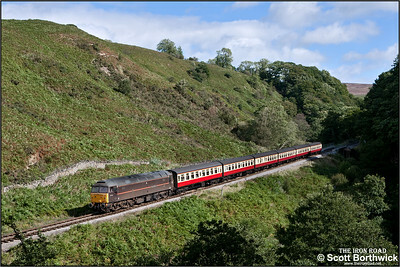 47798 'Prince William' coasts down the bank at Thomason Foss whilst working 1T12 1200 Pickering-Grosmont. 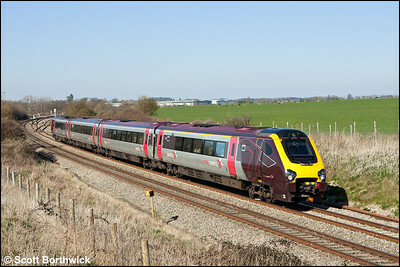 The train should have run to Whitby, however, a gas leak at Ruswarp had closed the Esk Valley line, so the service terminated at Grosmont. 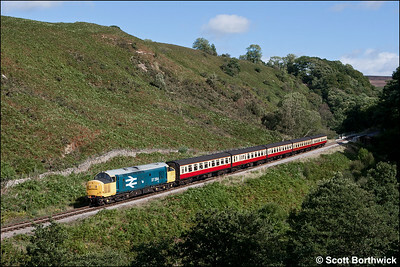 37264 rolls down the bank at Thomason Foss whilst working 2G08 1300 Pickering-Grosmont on 14/09/2012. 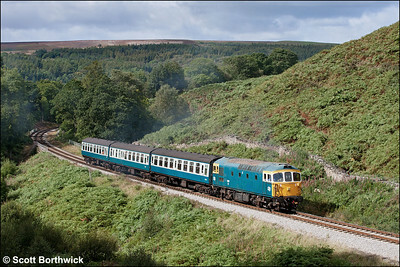 33108 thrashes up the bank at Beck Hole whilst working 2A35 1410 Grosmont-Goathland on 14/09/2012. 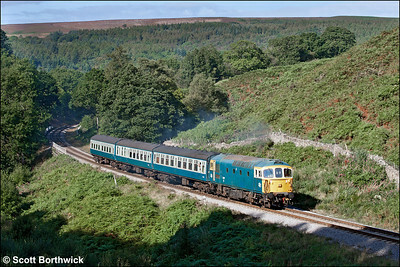 33108 descends the bank at Thomason Foss whilst working 2G36 1505 Goathland-Grosmont on 14/09/2012. 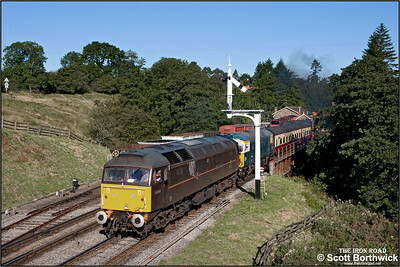 47798 'Prince William' passes Sadler House whilst in charge of 1T14 1600 Pickering-Grosmont on 14/09/2012. 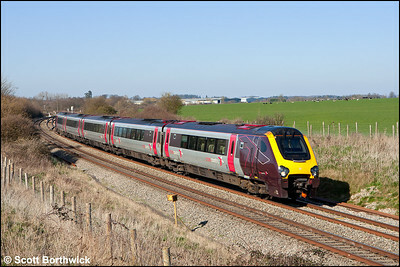 The train should have run to Whitby, however, a gas leak at Ruswarp had closed the Esk Valley line, so the service terminated at Grosmont. 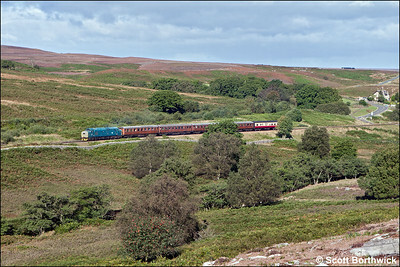 33108 approaches Sadler House whilst working 2P15 1630 Grosmont-Pickering on 14/09/2012. 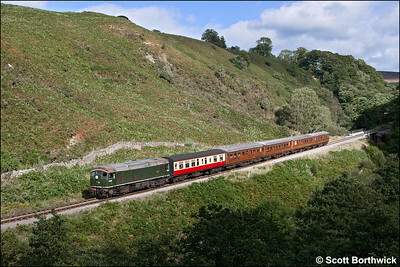 37264+37275 provide the traction for 2G16 1700 Pickering-Grosmont at Mooragtes on 14/09/2012. 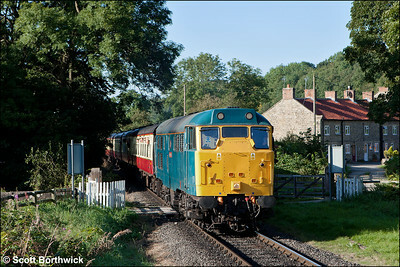 D7512 hitches a ride back to Grosmont on the rear of the train after failing with low power earlier in the day. 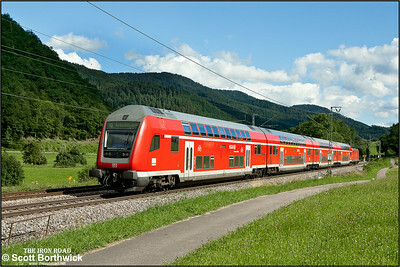 31128 'Charybdis' slows to exchange the token at Newbridge LC whilst working 1T10 0900 Pickering-Grosmont on 15/09/2012. 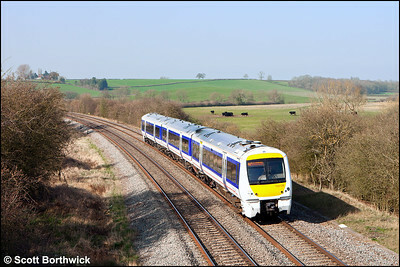 The train should have run to Whitby, however, a gas leak at Ruswarp had closed the Esk Valley line, so the service terminated at Grosmont. 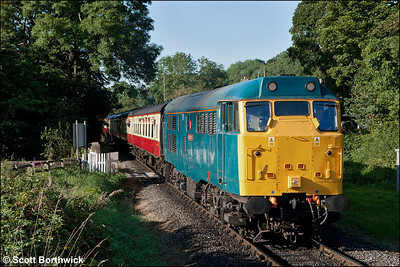 31128 'Charybdis' prepares to exchange the token at Newbridge LC whilst working 1T10 0900 Pickering-Grosmont on 15/09/2012. 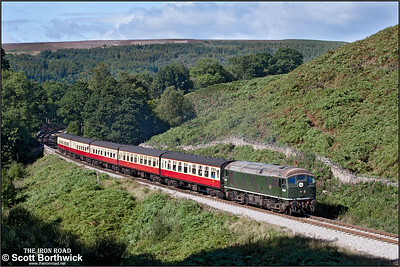 The train should have run to Whitby, however, a gas leak at Ruswarp had closed the Esk Valley line, so the service terminated at Grosmont. 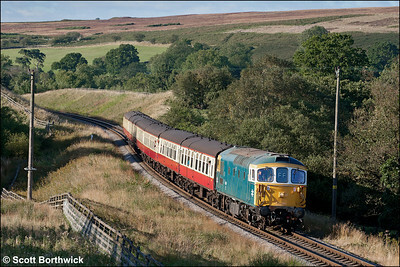 47798 'Prince William' pilots 33108 as they restart 2P01 0930 Grosmont-Pickering away from Goathland on 15/09/2012. 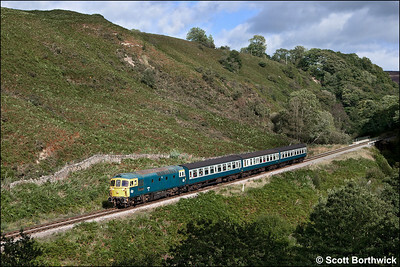 37275 crests the 1 in 97 gradient through Northdale whilst working 2G02 1000 Pickering-Grosmont on 15/09/2012.